Videos : College hockey fight betwene SMU and Texas Tech spills off the ice. College hockey fight betwene SMU and Texas Tech spills off the ice. Hockey fights gets out of hand. Things have really gotten out of hand at a college hockey game. On Saturday Texas Tech faced off against SMU in a college hockey game but everyone is talking about what happened off the ice in the later stages of the game. 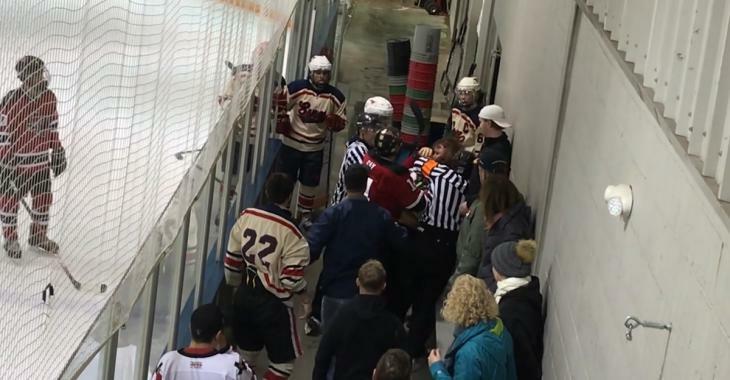 A fight broke out on the ice between two opposing players and it was quite clear that neither of them were ready to let things go long after the officials on the ice had stepped in to break things up. By the time it was all said and done it had taken no less than 4 officials to split up the two young men and even then it proved not to be enough. Both men were eventually escorted off the ice and to the locker room due to how much time was left in the game and it was not long before the fight once again renewed itself off the ice. This time though there were additional players involved including one particularly nasty cheap shot from behind on a totally unsuspecting player, and it was obvious that this had gone far too far. No word yet on what the consequences for this might be, but no doubt both players are facing potential suspensions, discipline from their respective schools, or worse.